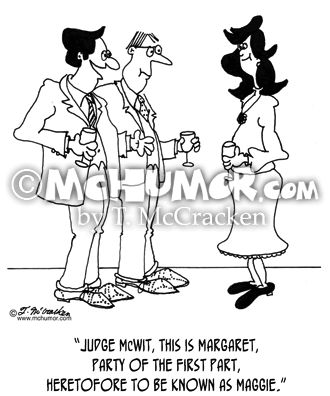 Judge Cartoon 5622: At a party a man making introductions saying, "Judge McWit, this is Margaret, party of the first part, heretofore to be known as Maggie." 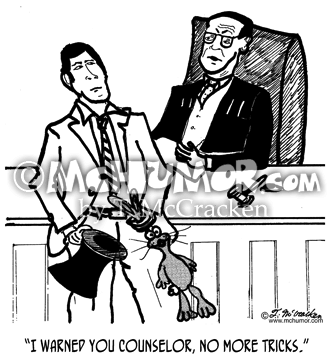 Rabbit Cartoon 2647: A judge saying to a lawyer pulling a rabbit out of a top hat, "I warned you counselor, no more tricks." 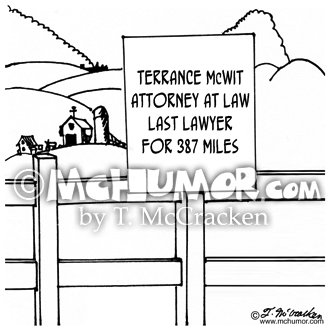 Lawyer Cartoon 8305: A lawyer says to another, "Remember, McWit. 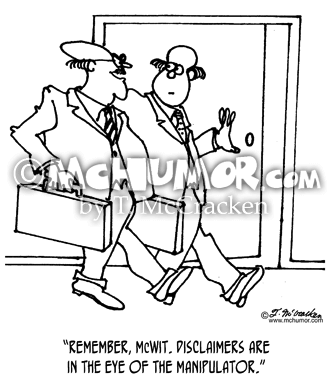 Disclaimers are in the eye of the manipulator." 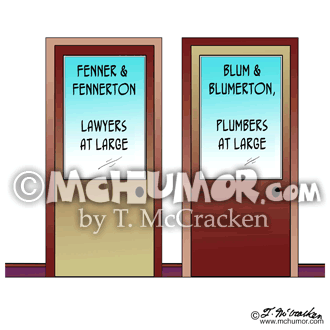 Plumber Cartoon 2405: "Fenner & Fennerton, Lawyers at Large" is next to "Blum & Blumerton, Plumbers at Large." 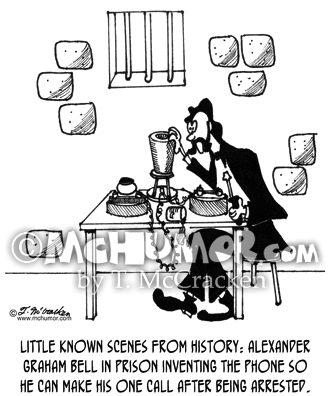 History Cartoon 4644: "Little Known Scenes From History: Alexander Graham Bell in prison inventing the phone so he can make his one call after being arrested." 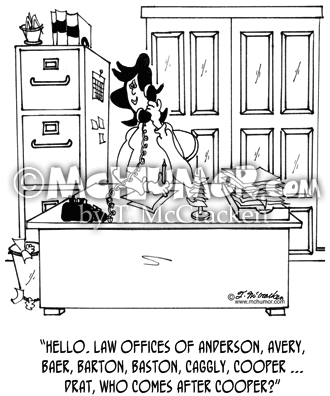 Lawyer Cartoon 5458: A woman answering the phone in an office says, "Hello. Law offices of Anderson, Avery, Baer, Barton, Baston, Caggly, Cooper ... drat, who comes after Cooper?" 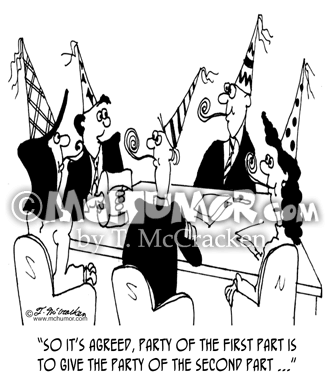 Party Cartoon 6795: A lawyer representing clients wearing party hats says, "So it's agreed, party of the first part is to give the party of the second part ..."
Lawyer Cartoon 5489: A sign on a country road, "Terrance McWit, Attorney at Law, Last Lawyer for 387 Miles." Attorney Cartoon 3651: Two drunks sit in a bar. 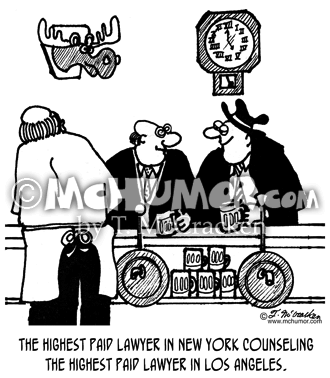 "The highest paid lawyer in New York counseling the highest paid lawyer in Los Angeles." 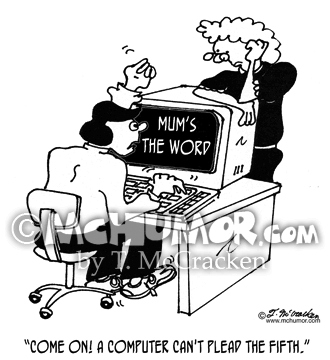 Computer Cartoon 3879: A man banging on a computer says, "Come on! A computer can't plead the fifth."